Statutory declarations can be used to declare many statements of fact. They are regularly used to confirm a person is single, not married and free to marry another person. For ONLY £54 we arrange for your Statutory Declaration to be issued with the apostille. The apostille is added to the original document to verify the signature of the solicitor or notary that has witnessed the declaration being signed. We do not recommend that a copy is processed unless you have lost the original document or do not have access to it. If a copy is processed you will need to visit the solicitor that prepared the original document and ask them to certify the copy. Statutory declarations are commonly prepared by solicitors and notaries. Your document should be signed in the physical presence of a UK solicitor or notary public so that your signature can be witnessed. How to order an apostille for your statutory declaration? 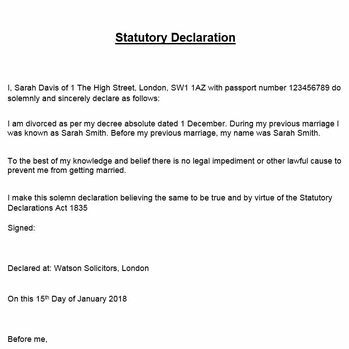 Make sure you sign the declaration in the presence of a UK solicitor or Notary Public. Following this, simply order the apostille service online and post the original signed document to us.